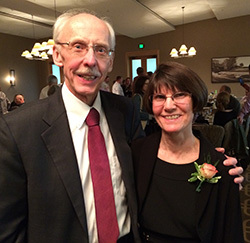 Call them stepping stones or building blocks—Deb Wagman’s foundation for life began at Augsburg University. Perhaps “paying it forward,” as Deb says, more aptly describes how she and her husband, Doug, think of their planned gift to Augsburg. With a gift in their will, also known as a bequest, the couple has not only returned that sense of gratitude, but they also are helping pave the way for tomorrow’s educational leaders through the Deborah K. and Douglas R. Wagman Education Scholarship. “It was an inspiration to witness how excited the Wagmans were to create a scholarship to help train future educators,” says Ann Ulring, director of leadership gifts. Graduating in 1978 as an elementary education major with a minor in library science, Deb worked in the teaching profession for 34 years; 25 of those were as a media specialist at an elementary school in Chaska, Minnesota. She saw firsthand the need for good, dedicated teachers. “I definitely believe in education. Education is power,” she says. As Deb sees it, the couple’s scholarship can bolster future educators and provide the stepping stones of success by easing students’ financial concerns. That way they can focus on learning the profession.